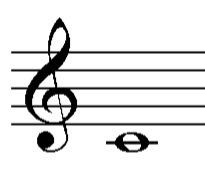 Middle C is designated C4 in scientific pitch notation because of the note's position as the fourth C key on a standard 88-key piano keyboard. Some musicians use the term to refer to the C note in their specific instrument's range. For example, middle C may be called "Low C" by someone playing a the trumpet or clarinet. This is technically inaccurate.